Where: South of Nowra, NSW. Difficulty: Intermediate with technical sections. Mountain biking on all 3 trails is super fun. The difficulty rating on these trails would be medium with some hard technical sections. The tracks flow extremely well and offer some excellent downhill runs. Getting to the trail heads I also enjoyed as my 4WD drive got a bit of a workout. The dirt road to the Coondoo trail was really rutted and I put the beast to work. It’s only a short dirt road to the trail head. So if you have a 2WD you could park off Forest Road and just ride down. There were also plenty of dirt roads to explore around the Superbowl and Butterfly tracks. So I took the car for a spin around there as well. 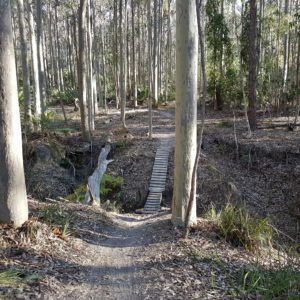 I had an awesome day mountain bike riding in Nowra and would highly recommend these trails. Directions to Nowra’s 3 Mountain bike tracks. Google Map Link. The Coondoo mountain bike trail is located south of Nowra. Head down the Princess Hwy and turn off at Forest Rd. Only 200m down Forest Rd turn right onto Western Rd. The trail head at the junction of Western Rd and Coondoo Rd. Google Map Link. Get back onto Forest Rd and continue for about 5km until you hit Butterfly Rd. Park on the right about 100m up the road. Note this track is ridden in a clockwise direction. Google Map Link. From the Superbowl mountain bike trail go approximately 2km along butterfly Rd. Nowra – Coondoo Trail Map. Note this track is ridden in a clockwise direction. Nowra – Butterfly Trail Map. Nowra – Superbowl Trail Map. Nowra mountain bike trail Photo Gallery. Old Mans Valley Youtube Clip. Directions to Nowra’s 3 Mountain Bike trails. Mountain bike riding shoalhaven, shoalhaven MTB trails, shoalhaven mountain bike tracks, tracks, trails, shoalhaven mountain bike park, Nowra mountain riding, Nowra mountain bike trails.